GLOBAL WATER ENGINEERING or “GWE“ a Member of Global Water Engineering Group of Companies, is industrial wastewater treatment, water reuse, and green energy solutions provider to the global marketplace. To that end, GWE offers state-of-the-art technologies to assist industries and private owners in their efforts to grow while reducing the costs of doing business. From some of the world’s leading anaerobic wastewater treatment and organic waste-to-energy processes to a variety of top-of-the-line aerobic technologies, GWE has one of the most extensive portfolios of technology for industrial wastewater management, water reuse, and renewable energy generation/utilization. With hundreds of worldwide installations and over 40 years of application experience, we can tackle the toughest wastewater and organic waste-to-energy problems. We can provide design, technology, and services packages for any of our proprietary technologies, or if desired, complete turnkey services including complete design, construction, and installation of the entire system (in conjunction with engineering and construction partners). In either case, GWE offer performance guarantees and aftercare support to ensure peace of mind for our clients. Our experienced team and optimized project execution procedures allow us successfully to finish every project in a timely fashion. All projects are executed in accordance with GWE’s Quality Assurance System, based on ISO 9001-2014 standards. Our uncompromising dedication to our customers makes GWE your reliable partner, whether you are a small local firm, a multinational corporation, or global Fortune 500 company. GWE aims to be a reliable supplier of water and wastewater treatment technologies of the highest standards, adapted to each specific situation, and at affordable prices. GWE supplies practical and modern technologies and "best buy" solutions that provide consistent performance, meet all guarantees, and fully satisfy our clients and business partners. Our founder and Chairman/CEO, Jean-Pierre Ombregt, is a pioneer of modern anaerobic wastewater treatment and his involvement in the development of our Upflow Anaerobic Sludge Blanket (UASB) systems, GWE’s ANUBIX™ product line, dates back as far as 1972. Throughout the years, GWE has developed an extended network of qualified local partners in more than 20 countries and currently operates globally through regional offices in Belgium, Germany, Hong Kong, The Netherlands, Philippines, Thailand & USA. GWE has 30 years experience with all types of wastewater, in particular industrial, which makes us the most reliable and global partner for all your wastewater needs. 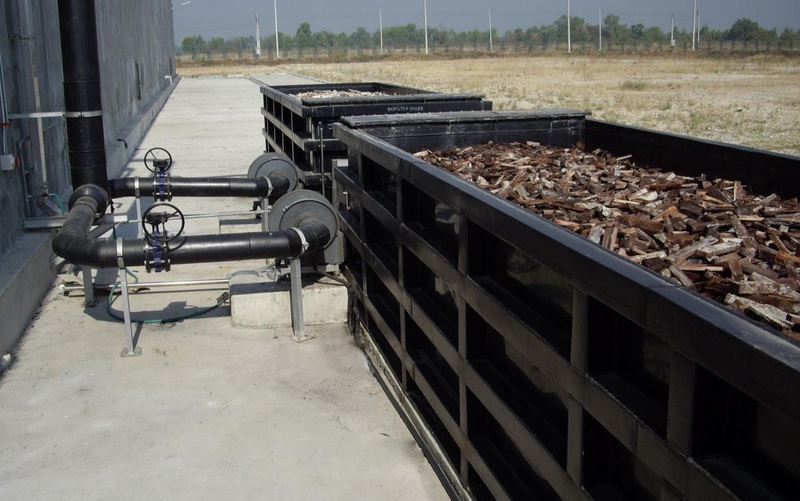 Our extensive list of advanced anaerobic, aerobic and physicochemical processes is second to none, which means we offer tailor made solutions for all types of wastewater with mainly organic pollution. With our range of primary, secondary and tertiary treatment applications we can achieve up to 99% COD removal in some types of wastewater, e.g. starch industry wastewater with 15,000 mg/l COD. GWE specializes in anaerobic treatment systems, as they offer major economical advantages compared to aerobic treatment systems. Convert your waste into energy! Use GWE’s expertise to make biogas out of organic residues. - Food: food and organic waste, wet or dry, e.g. tapioca pulp from starch or ethanol factories. - High TSS sludge and industrial slurries – waste from fish canning, dairy, bioethanol industry. - Animal waste & manure. For pictures of a few actual GWE waste water treatment plants, click here. BIG NEWS THESE DAYS - OLD NEWS for us! GWE has successfully built and commissioned over 50 biogas utilisation plants for clients worldwide over the past 15 years. Our biogas guarantees are unmatched in the industry and we have a documented 100% track record in meeting and exceeding them. We combine specialized know-how in generating biogas with our extensive range of anaerobic reactors, and in supply and installation of biogas re-use and handling systems for fossil fuel replacement or power generation. For pictures of some actual GWE Biogas Reuse references, please click here. At Global Water Engineering we understand wastewater operations. Drawing from the knowledge and expertise gained through our world wide references, you can trust us to operate your treatment plant. Global Water Engineering provides a full range of solutions, from the individual aspects of consultancy and assistance to the provision of integrated wastewater services. GWE supplies different types of anaerobic seed sludge like anaerobic seed sludge or specially adapted thermophilic digester sludge. We support the customer in making the right selection based on his specific case and our expertise. anaerobic seed sludge can be used to enhance the performance of moderate to high loaded anaerobic upflow reactors.